Smartphones have changed the way we look at the world, connect with family and friends and do all sorts of daily tasks, but now you can even use these smartphones to track family members, follow a someone while in another country or simply ensure the safety of children and loved ones. Android has recently become the leader and smartphones by overtaking the world renowned iOS from Apple. Over 1,6 million applications are available fro Android devices, which includes a lot of useless apps, but also many that make life easier. The Real-Time GPS Tracker app is completely free and only available on Android devices. This allows users to share real-time location details with each other no matter where you are. Using a GPS signal, which is stronger than a data signal, you will be able to track approved family members and see their exact location. The app provides many settings that can adjust privacy or when someone will be able to track you. With family members and loved ones, the apps allow tracking without the other person interaction. This feature is excellent when loved ones cannot be contacted or while they are driving. The app will update on their locations within seconds once logged in. As an additional security measure, the app can be used to track children’s location. Once again users can see exactly where the mobile device is where it’s headed. The apps also include the ability to lock the device in case of theft, which will then require a matching password before the phone will become useful again. Users can also take advantage of remote control over the mobile device in this case to remove all data from the phone to ensure sensitive information is protected. 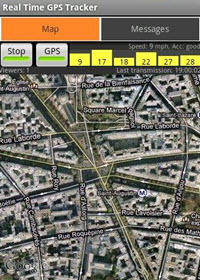 There are a few of these apps available, but not quite as many with all the features offered by Real-Time GPS Tracker that are free. Unfortunately, the app is unavailable with iPhones, which means all users need to have Android devices or access Google Maps on a PC to track allowed devices. We are hoping the developer will create and iOS app that allows users with either iOS or Android to enjoy the features offered.